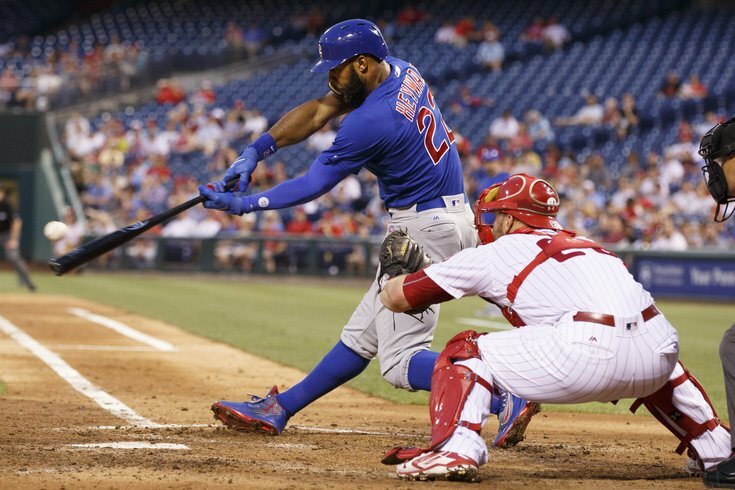 Chicago Cubs' Jason Heyward, left, hits a two-run home run in front of Philadelphia Phillies catcher Cameron Rupp during the fourth inning. You’re a Phillies fan. You looked at the pitching match-ups for this week’s series against the Chicago Cubs, figuring you’d like to get a look at baseball’s best team in their one visit to South Philly this season. You saw that the weather people calling for a picture perfect night for the first game of the series. But you also saw it was former Red Sox ace Jon Lester, owner of a 2.80 ERA in his last 75 big league starts, against fellow lefty Adam Morgan, owner of an ERA this season (7.07) that sounded more like an airliner. You were scared, so you stayed away. But the real discrepancy between the two teams at large didn’t have anything to do with the two men that would share the mound at Citizens Bank Park, but rather the 16 other players that would share the batter’s box. On most nights, it would mean the Phillies didn’t stand a chance. Dexter Fowler, the game’s first batter, led off with a double and scored, two-hole hitter Jason Heyward drilled a two-run home run in the fourth inning, and middle-of-the-lineup mashers Kris Bryant, Anthony Rizzo, and Jorge Soler, before the latter left with a hamstring injury, must have felt like they were on base all night as the Cubs hung on for a 6-4 win over the Phils. The aforementioned, top five hitters in the Cubs lineup went a combined 12-for-22 with three doubles and a home run. The Phillies, meanwhile, avoided their third shutout of the season when Freddy Galvis ripped a three-run home run. Tommy Joseph followed with a solo shot. “It wasn’t very exciting for eight innings,” manager Pete Mackanin said. “But the ninth was exciting." But even Galvis’s night – 0-for-3 with three strikeouts before the home run, extending an 0-for-22 skid overall – reminded Mackanin of what’s wrong with his flawed lineup. He noted how Galvis struck out on the same pitch in each of his first three at-bats on Monday. The Cubs, who have scored 115 more runs than the Phillies this season in two fewer games, out-hit the home team 13-4 entering the ninth inning on Monday night. The Phillies are averaging 3.24 runs per game, or more than two runs fewer than the Cubs (5.4 RPG). • Through 58 games, the Phillies are on pace to score 525 runs this season. In 134 years in franchise history, including 84 seasons when they played fewer than 162 games in a season, the Phillies have managed to score fewer than 525 runs in a season just 14 times. • Seven of those 14 seasons came before 1920, during the Dead Ball Era. Two more came in strike-shortened seasons. • Among non-strike shortened seasons, the most recent Phillies team that scored fewer than 525 runs in a season were the 1972 Phillies (503 runs in 156 games). The 1972 Phillies, the worst team in the National League, were only notable in history because Steve Carlton won 27 of their 59 wins with a nifty 1.97 ERA. • And the 1972 offense wasn’t as bad as the 2016 Phillies offense when you consider the era. In 1972, six of the league’s 12 teams scored fewer than 600 runs. Last year, zero of the NL’s 15 teams scored fewer than 600 runs. The NL average for runs in 1972 was 605 runs; in 2015, that number was 666. Morgan, who is coming up on the one-year anniversary of his MLB debut, entered the night 0-4 with a 9.61 ERA in his last four starts. From the recent comments from his manager, the 26-year-old left-hander may have been pitching for his job with the likes of Zach Eflin, Jake Thompson, and Ben Lively at Triple-A Lehigh Valley. Morgan's night did not begin well, with booming doubles to two of the game's first three batters. But he managed to escape the inning with one run of damage. And despite needing 45 pitches to get through his first two innings, Morgan managed to go six innings and kept the game in striking distance against Lester and the National League's most potent lineup. "You could see the determination in his eyes – he really wanted to have a good outing," Mackanin said. "He knows he has to pitch better. And he did today, which was good to see." Ryan Howard, who thanked many fans for reaching out with positive words in the two days since one unruly fan threw a beer bottle at him on Saturday, received a standing ovation when he came out to pinch hit in the ninth. Howard has been out of Mackanin's starting lineup for six straight games; he'll start on Tuesday night in place of Tommy Joseph at first base. But Joseph homered in the ninth inning. And he hit .375 (9-for-24) with two home runs and a double in his six-game audition for the regular first base job. Mackanin said he'll play Howard on Tuesday and "go from there." "I'm going to get a look at him, see how he looks," Mackanin said. "Then I'll probably make a decision with how I'm going to handle the whole thing in the near future." Prior to Monday's game, Howard remained upbeat and had nice things to say about the rookie who could be taking his regular job. • Jon Lester held the Phillies to four hits, struck out nine and walked no one in eight shutout innings. He improved to 6-0 with a 1.46 ERA in eight career starts against the Phillies, and 4-0 wth a 1.29 ERA in five games at Citizens Bank Park. • The Phillies are having a case of the Mondays in 2016. They fell to 0-8 this season on the first workday of the week and 13 straight Monday games since last season. Their last Monday win? On July 20, 2015. • Jerad Eickhoff will look to avoid what would be his major league-leading ninth loss of the season when he takes the mound against the Cubs on Tuesday night. Eickhoff allowed four runs on eight hits in six innings against the Cubs on May 28. He is currently tied with New York Mets right-hander Matt Harvey with the MLB lead in losses (eight).